As Chinese space lab Tiangong-1 re-entered the Earth's atmosphere on Monday, burning up in the skies over the central region of the South Pacific, residents of the country bid the spacecraft a final farewell. Regarded as a pioneer of China's future space station, the experimental space lab re-entered the Earth's atmosphere at around 8.15 a.m. on Monday, Xinhua news agency reported citing the China Manned Space Engineering Office (CMSEO). "Tiangong-1 has carried millions of Chinese' space dream. Although it's only aimed to test the technologies for space station, it has many far-reaching effects," Mao Xinyuan, a columnist, was quoted as saying. The spacecraft was in service for four and a half years, two and a half years longer than initially planned, making important contributions to China's manned space cause and paving the way for China to become the third country in the world to build a permanent space station around 2022. "The important role of Tiangong-1 would go down in China's space history. It had helped us accumulate precious experience in constructing space station," said Huang Weifen, Deputy Chief Designer of the Astronaut Center of China. The Tiangong-1, whose name translates as "Heavenly Palace 1," had previously docked with Shenzhou-8, Shenzhou-9 and Shenzhou-10 spacecraft, and was visited by six astronauts, including two females. 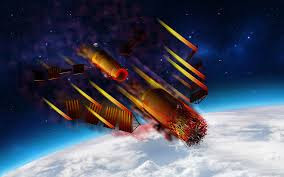 "Although Tiangong-1 was only a transitional platform between the spaceship and space station, it's a key step for China to acquire the spacecraft docking technology, and it demonstrated the possibility of long-time space residence for the Chinese," said Bai Ruixue, a former space journalist and now CEO of a company focusing on public understanding of space science. "The scientific imagination aroused by it among the Chinese is invaluable," Bai said. NASA's first space station, Skylab, fell to Earth in an out-of-control re-entry in 1979, burning up harmlessly in the process, CNN reported.